Average wholesale electric power prices rose in 2010, due to higher national natural gas prices and increased demand for electricity, particularly in the Eastern United States. The annual average of on-peak (daytime, weekday) power prices (shown above for select trading hubs) increased from 2009 levels in every case. Overall electric demand increased as a result of recovering economic activity and higher air conditioning use in regions that experienced hotter-than-normal summer weather. The smallest increase was in the Pacific Northwest due to relatively mild weather during the year. 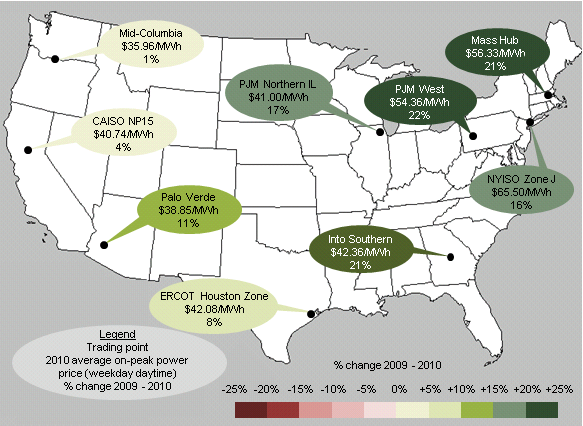 In the Eastern United States, electricity prices increased significantly in 2010. During 2009, the weather was often mild and a weak economy decreased overall electric power demand. During 2010, a hotter-than-normal summer in the East prompted electric system operators to dispatch the more expensive generating units more frequently.